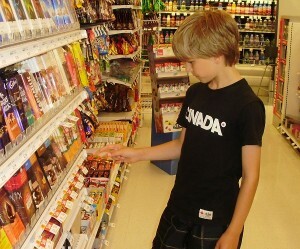 The author's son tries to find organic fair trade chocolate. Kids are ripe for conversations about right and wrong. They are concerned about the planet and natural beauty, and they are bombarded with messages about disappearing rainforests, pollution in the water, and carbon footprints. They participate in fundraising to send money to children in other parts of the world so that they have food, water, and clothing. At the same time, though, they are subject to relentless messages about needing more and better. We don’t have TV in our house, but my children go to the local public school and come home with requests for the branded toys of the day and the packaged and processed foods that are common in the lunchroom. In the face of that, it is important to me that I teach my kids why we make the choices that we do. It is not that I believe that we can save the world by shopping green; what I most want to teach my kids is how to be happy while consuming less. We make an effort to grow much of our own food organically, make do with what we have, and repair when possible. Still, we have to eat, we have to clothe ourselves, and we prefer to continue to participate in society. In the world we live in, much of that is accomplished by purchasing. So far, we’re striking a particular balance as we strive towards a better equilibrium of our needs and those of the planet. My kids have become the ones who ask me how the animals were raised when we are purchasing meat and buy fair trade chocolate for gift exchanges. I have little moments of satisfaction when the oldest one says, “we don’t really need that, you know.” They hold me to a higher standard. If you’re interested in letting your children become part of the voice of conscience, here are some suggestions that seem to be working for me. I try to take each of my children grocery shopping by themselves from time to time. That way I have the chance to answer their questions and explain what I’m looking for and why I’m looking for it. I’ve tried talking to them out of context, but they are more interested in the moment. Food that we are putting away or ingredients that are already in the cupboard just don’t seem to be as ripe for conversation. I don’t actually know the answers. Maybe New Zealand apples (in season in January) are better than apples from down the road that were cold-stored for 6 months. Vegetarian versus grass-raised beef? Local or organic? Fair trade or organic? Is the carbon footprint of going to the market higher than that of bringing all those trucks to the grocery store? How do we even find out about labor practices? I wish I had better answers, and I’m afraid that I’m not making the best choices, but I’m making the best choices I can under the circumstances. Teach them to read labels. Once you know what your priorities are, you can explain them to your kids. You can also help them find out the information about the things that they are looking at by teaching them to look at the labels. I generally start with the “country of origin”, but I also look for fair trade and organic labels. While I was writing this piece, I asked my oldest son why I did that, and he was able to give me pretty good answers, so I know that he’s been paying attention. Grow, build, or make some of your own things. Be honest about why you are making your choices. I find that the best solution to the meat problem is to go to the farmers market and buy from the farmer. Over the years, I have learned the names of the farmers and have become friends with some of them. I know where my meat comes from. (This is one of the luxuries of living in a very small community.) This can also be a great way to get to know some of your local craftspeople. You might be able to find some lovely wooden toys made from local wood or creative gifts for Grandma when the season comes around. I can’t usually buy fair trade and local and organic and ethically raised. I can let this paralyze me, or I can get angry, or I can do the best I can do. In different weeks, I make different choices. In my experience, I can make myself squirrelly trying to find the perfect solution, or I can admit that I’m frustrated but I have to find some answer. This is something I want to model for the kids as well; this system has some major problems with it, but opting out is extremely difficult. As long as we’re going to continue to benefit from our ability to purchase needs and wants, we will do our best to consider the impacts we have by doing that. Good tips! It’s hard explaining to kids about real food! It *is* hard, and I find that I’m constantly working against the dominant culture. After this many years, they are kind of immersed in the conversation, though. I think it is telling that when my son chose to give fair trade chocolate to the last gift exchange, the whole class knew who it was from… but maybe that will start to spread in their consciousness, too. I really appreciate these tips. You’re inspiring me to begin these types of conversations now. I like the idea of sort of just thinking out loud and letting them hear the decision process. I think that it’s important to remove the mystery. They want to have the same things as everybody else, but in the community that I’m living in that means astonishing amounts of candy, hot dogs, french fries, and video games. It’s hard to say, “no”, again and again. I sometimes wonder whether the constant stream of explanations isn’t also for my own benefit to help justify the choices that I’m making. These are great tips. I explain to my oldest why I don’t buy certain things, but I never really thought to take him to the store with me. In-the-moment learning sticks with him longer than lecture-style learning any day! Wonderful tips! I had to laugh at the “Talk as you walk” suggestion because I tend to narrate as I shop. And my son is under two! I suppose over time he’ll pick up on why I make the choices I do. I also found your tips to cut yourself some slack incredibly insightful. It’s a lot easier to be a conscientious consumer if you’re not trying to be perfect at it!